Combine eggs, pumpkin, milk and oil in large mixing bowl. Add flour, brown sugar, baking powder, pumpkin pie spice and salt to egg mixture. Stir gently. Lightly spray a large skillet or griddle with non-stick cooking spray or lightly wipe with oil. Heat skillet or griddle over medium-high heat (300 degrees in an electric skillet). Using a 1/4 cup measure, pour batter on hot griddle. Put a face on the jack-o-lantern, using raisins for eyes and teeth. Drop raisins in batter while it cooks. 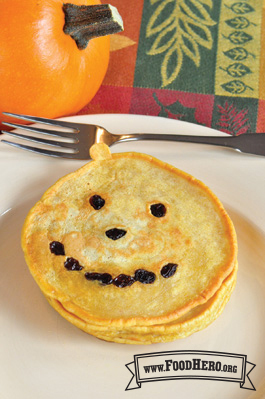 Pancakes are ready to turn when tops are bubbly all over, and the edges begin to appear dry. Use a quick flip with a broad spatula to turn pancakes. Turn only once. Continue to bake until bottoms are brown and dry. No pumpkin pie spice? Use 1/2 teaspoon cinnamon, 1/2 teaspoon dry ginger, and 1/8 teaspoon cloves or nutmeg. Try using 1 cup whole wheat flour and 1 cup all-purpose flour for more whole grains!